Logen Ninefingers, infamous barbarian, has finally run out of luck. Caught up in one feud too many he’s about to become a dead barbarian, leaving nothing behind but bad songs and dead friends. Jezal dan Luthar, paragon of selfishness, has nothing more dangerous in mind than winning glory in the fencing circle. But war is brewing, and on the battlefields of the frozen North they fight by altogether bloodier rules. 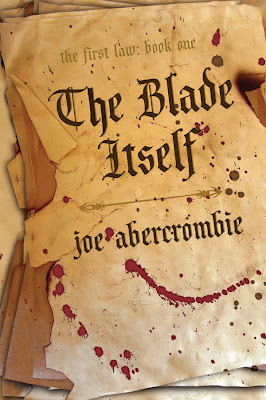 Source: Info in the About The Blade Itself was taken from the book’s cover sleeve. The entire book is just an introduction to the world of The First Law Trilogy with the usual formula of a wizard, a warrior, and a motley crew. The book keeps multiple threads running at the same time and jumps from thread to thread from chapter to chapter. I don’t like this writing style because I tend to forget what is going on with a thread while reading 2 or so chapters on a different thread. So when the book jumps back to that thread I have to re-read the previous chapter on that thread to recall what was going on with that thread of the story. This makes the pace very slow. So slow that I sometimes loose patience and put the book down to pick up another. And when I’ve forgotten my impatience, I pick this book up again. Another reason I don’t like this kind of writing style is that the story looses continuity and the flow of the story is constantly disrupted. This tends to make my interest wane and I have to use “will” to finish the book. The loss of continuity and constant disruption to the flow of the story sometimes irritate me so, that I abandon reading the book. I did put this book down a few times which is why it took almost a year to read it. The author has a good voice though that the story flows well for me, that is, until the flow gets disrupted when the book jumps to another thread. I find that really annoying, so I cheat. I follow one thread and jumps chapters which is not of that thread, until it intersects with another thread and then I go back and read that other thread which it intersects with. I use color coded little sticky index markers to help me keep track. Slow going. Annoying. To top it off, this book ended in a big, whooping cliffhanger. My suggestion is, don’t start reading this book if you do not have all three books of The First Law trilogy in your possession, so that as soon as you hit the cliffhanger at the end of this book you can continue reading on to Book 2 which would make it a whole lot less annoying.